Recently released Senate Intelligence Committee’s report on CIA torture featured a key character in the agency’s string of horrific misdeeds. Alfreda Frances Bikowsky is a career CIA officer, who remains in a senior position at the agency, having headed the Bin Laden Issue Station (also known as its code name, Alec Station) and the Global Jihad unit. She is a former Soviet analyst, who has worked in the CIA’s Counterterrorist Center and in the Al Qaeda unit since the mid-1990s. While the agency refuses to publicly name Bikowsky, her name was deduced by Salon reporters Rory O’connor and Ray Nowosielski, as well as a contemporary historian Kevin Fenton, in 2011. Bikowsky had been referenced in Jane Mayer’s book “The Dark Side,” by her middle name, Frances. As a supervisor and an analyst in the pre-911 world, Bikowsky dropped the ball when the CIA was given information that might very well have prevented the 9/11 attacks. The agency knew that one of Al Qaeda operatives, Khalid al-Mihdhar, had obtained a multiple-entry visa into the United States eighteen months before 9/11. To cover up her failure to share this information, Bikowsky claimed to congressional investigators to have hand-delivered Khalid Al Mihdhar visa information to FBI headquarters. This was proven false, when the investigators checked the log books at the FBI headquarters and discovered that she had never set foot in the building. Months before the attacks of 9/11, the CIA also learned that another Al Qaeda operative, Nawaf al-Hazmi, had flown into Los Angeles. Again, the agency did nothing to inform the FBI. Congressional investigators found no evidence that the FBI had ever received the information that was supposedly shared by the CIA. Bikowsky gladly participated in post 9/11 torture sessions and misinterpreted intelligence in ways that sent CIA on an absurd goose chase for Al Qaeda sleeper cells in Montana. She then falsely represented to congressional overseers that the torture worked. Many of her co-workers were shocked that Bikowsky has been entrusted with so much power. A former intelligence officer who worked directly with her was quoted as saying that Bikowsky bears so much responsibility for numerous intelligence failures that “she should be put on trial and put in jail for what she has done.” Instead, she has been promoted to the rank tantamount to a general in the military, overseeing the worldwide targeting of terror suspects. Red-headed Bikowsky served as one of the composite characters used to create Maya, the lead character in a feature film “Zero Dark Thirty.” According to the Senate report, she wrote the “template on which future justifications for the CIA program and the CIA’s enhanced interrogation techniques were based.” She is one of the key architects of the CIA’s “enhanced interrogation program,” who developed misleading talking points used to repeatedly misrepresent the effectiveness of torture in gathering intelligence. Bikowsky was also responsible for ordering the detention of someone who ended up being completely unrelated to Al Qaeda. She oversaw the rendition and gruesome interrogation of another detainee, whose unjustified detention was a case of mistaken identity. The CIA was incompetent to the point of capturing and torturing two of its own informants, before realizing who they were. One detainee, who was captured based on false information in a vendetta against his family, was supposed to be promptly released back to his village along with a payment for unjust detention. Instead, the CIA transferred him to U.S. military custody, causing the man to be kept in detention for four more years. In spite of glaring, inexcusable mistakes, the CIA Director deemed that no action against responsible CIA personnel was warranted, because “mistakes should be expected in a business filled with uncertainty” and “CIA leadership must stand behind the officers who make them.” In 2007, Bikowsky accompanied former CIA director Michael Hayden to brief Congress, where she falsely exclaimed that the torture program had been a great success. In spite of being cooperative and providing important information, detainees were tortured for no apparent reason. For example, Hassan Ghul “sang like a tweetie bird … opened up right away and was cooperative from the outset.” After providing valuable data that led to the dissemination of 21 intelligence reports, the CIA requested approval for employing “enhanced interrogation techniques” against him. Ghul was handcuffed to the wall with his hands above his head for days. Following a series of inhumane tactics, Ghul was in severe pain and experienced mild paralysis of arms, legs and feet. He had been tormented to the point of experiencing vivid hallucinations. Instead of intelligence gathering, torture tactics were used for “behavior adjustment purposes,” to achieve the “desired level of helplessness” or “in response to perceived disrespect.” For example, CIA interrogators tortured detainees for their failure to call them “Sir,” for having “a blank stare,” for failure to position themselves on the waterboard in response to interrogator snapping his fingers, or for complaining about physical pain. Torture was often applied before any questions were asked, or before the detainee had the chance to answer. CIA interrogators threatened detainees’ children and said they would bring in the detainee’s mother and sexually assault her in front of him. They also used a gun and a drill to threaten the detainees, placed them into simulated coffins for prolonged time periods, subjected them to mock burials and placed a detainee in a box filled with insects, knowing that he suffered from intense Entomophobia. Detainee Abu Zubaydah spent a total of over 11 days locked in a coffin-size box and 29 hours in a small confinement box (21 inches wide, 2.5 feet deep and 2.5 feet long). The CIA interrogators told him that the only way he was ever going to leave the facility was in the coffin-sized confinement box. Another detainee, Majid Khan, was tortured to the point of becoming desperately suicidal, wherein he attempted to “chew into his arm at the inner elbow” and “to cut a vein in the top of his foot,” believing death to be the only way to escape from his CIA tormentors. Detainees were tortured to the point of a complete emotional breakdown and permanent physiological impairment. CIA interrogations took precedence over the direly needed medical care. For example, detainee Abu Zubaydah was kept completely naked, wasn’t allowed to clean himself after using the bathroom or at any other time, deprived of even minimal hygienic self-care, fed a “bare bones” liquid diet and subjected to the non-stop use of the CIA’s torture tactics. His surgical wound was deteriorating and opening up, while he was intentionally denied medical treatment. Detainee Gul Rahman literally froze to death, while short-chained to the floor in a sitting position, while wearing nothing but a sweatshirt. CIA personnel who witnessed the torture were profoundly affected and disturbed “to the point of tears and choking up.” Realizing the brutality of the agency’s treatment of detainees, CIA General Counsel Scott Muller expressed concern that the CIA’s program was inconsistent with statements from the Administration that the U.S. government’s treatment of detainees was “humane.” He sought confirmation that “a February 7, 2002 Presidential Memorandum requiring the U.S. military to treat its detainees humanely did not apply to the CIA.” Following those inquiries, the White House press secretary was advised to avoid the term “humane treatment” when discussing CIA detainees. 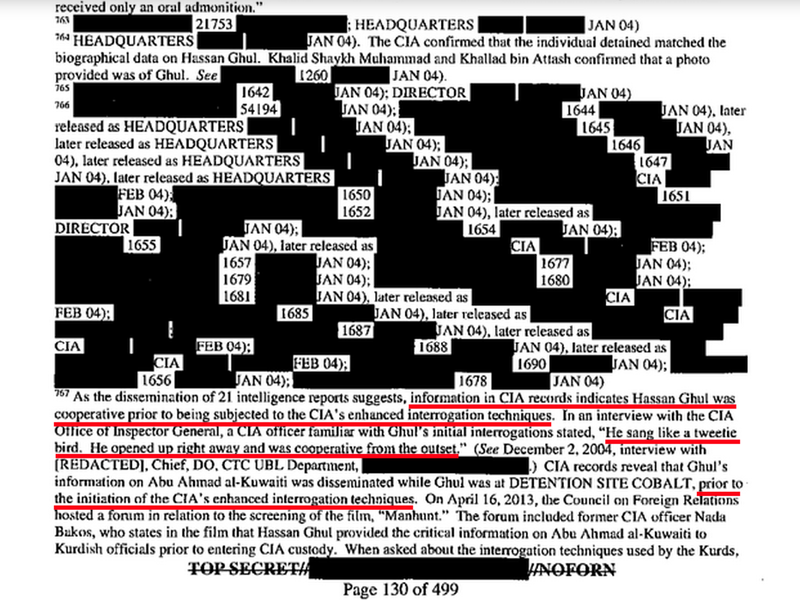 CIA wanted the public to think that its brutality in the treatment of detainees “saved lives” and that EIT’s (including the water board) have been indispensable to our successes,” preventing “major terrorist attacks involving hundreds, if not thousands of casualties.” Congressional review of CIA’s records determined that such claims were “almost entirely inaccurate.” The agency was rightly concerned that “if the general public were to find out about this program, many would believe we are torturers.” There is simply no other conclusion to be made.